Absorption lines in the visible spectrum of a supercluster of distant galaxies (right), as compared to absorption lines in the optical spectrum of the Sun (left). Arrows indicate redshift. 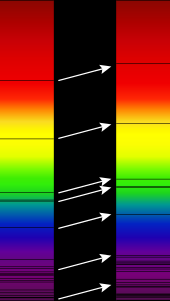 Wavelength increases up towards the red and beyond (frequency decreases). The doppler-shift-measured velocity of galaxies moving away from Earth, is proportional to their distance from the Earth and all other interstellar bodies. In effect, the space-time volume of the observable universe is expanding and Hubble's law is the direct physical observation of this. It is the basis for believing in the expansion of the universe and is evidence often cited in support of the Big Bang model. Although widely attributed to Edwin Hubble, the law was first derived from the General Relativity equations by Georges Lemaître in a 1927 article. There he proposed that the Universe is expanding, and suggested a value for the rate of expansion, now called the Hubble constant. Two years later Edwin Hubble confirmed the existence of that law and determined a more accurate value for the constant that now bears his name. The recession velocity of the objects was inferred from their redshifts, many measured earlier by Vesto Slipher in 1917 and related to velocity by him. The law is often expressed by the equation v = H0D, with H0 the constant of proportionality (the Hubble constant) between the "proper distance" D to a galaxy and its velocity v (see Uses of the proper distance). H0 is usually quoted in (km/s)/Mpc, which gives the speed in km/s of a galaxy 1 megaparsec (3.09×1019 km) away. The reciprocal of H0 is the Hubble time. A recent 2011 estimate of the Hubble constant, which used a new infrared camera on the Hubble Space Telescope (HST) to measure the distance and redshift for a collection of astronomical objects, gives a value of H0 = 73.8 ± 2.4 (km/s)/Mpc. An alternate approach using data from galactic clusters gave a value of H0 = 67.0 ± 3.2 (km/s)/Mpc. A number of other methods have been used, giving figures between 70 and 72 (km/s)/Mpc. A recent (2016) method using the oldest light in the universe suggests the Hubble Constant value was 66.53km/s per megaparsec soon after the expansion began. This implies that the rate of expansion has been increasing. ↑ Peter Coles, ed. (2001). Routledge critical dictionary of the new cosmology. Routledge. p. 202. ISBN 0-203-16457-1. ↑ Lemaître, Georges (1927). "Un univers homogène de masse constante et de rayon croissant rendant compte de la vitesse radiale des nébuleuses extra-galactiques". Annales de la Société Scientifique de Bruxelles A47: 49–56 (Full article, PDF). Partially translated (the translator remains unidentified) in Lemaître, Georges (1931). "Expansion of the universe, A homogeneous universe of constant mass and increasing radius accounting for the radial velocity of extra-galactic nebulæ". Monthly Notices of the Royal Astronomical Society 91: 483–490 . ↑ Bergh, Sidney van den (6 June 2011). "The Curious Case of Lemaitre's Equation No. 24". arXiv:1106.1195 [astro-ph, physics:physics]. http://arxiv.org/abs/1106.1195. ↑ Block, David L. (13 February 2019). "Georges Lemaitre and Stiglers Law of Eponymy". arXiv:1106.3928 [astro-ph, physics:physics] 395: 89–96. doi:10.1007/978-3-642-32254-9_8. http://arxiv.org/abs/1106.3928. ↑ Reich, Eugenie Samuel (27 June 2011). "Edwin Hubble in translation trouble". Nature. doi:10.1038/news.2011.385. http://www.nature.com/doifinder/10.1038/news.2011.385. ↑ Malcolm S Longair (2006). The Cosmic Century. Cambridge University Press. p. 109. ISBN 0-521-47436-1. ↑ Riess, Adam G. et al (2011). "A 3% solution: determination of the Hubble constant with the Hubble Space Telescope and Wide Field Camera". The Astrophysics Journal 730 (2): 119. doi:10.1088/0004-637X/730/2/119. http://hubblesite.org/pubinfo/pdf/2011/08/pdf.pdf. ↑ 'New study gives dark energy a boost' (Ron Cowen), Science News, 16 March 2011. ↑ Beutler, Florian et al (2011). "The 6dF Galaxy Survey: baryon acoustic oscillations and the local Hubble constant". Monthly Notices of the Royal Astronomical Society 416 (4): 3017. doi:10.1111/j.1365-2966.2011.19250.x. ↑ 'Hubble Constant: a new way to measure the expansion of the universe', Science Daily, 27 July 2011.